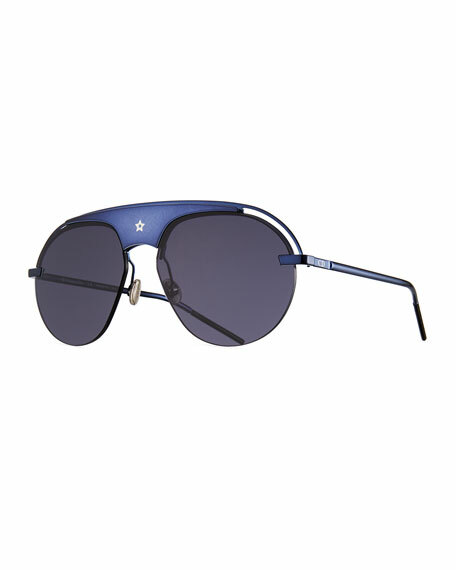 Dior "Stell3" aviator sunglasses in metal. Mirrored lenses; logo script at left lens. The storied House of Dior traces its roots to 1947, when Christian Dior debuted his first collection to world acclaim. Dubbed the New Look, it established a ravishing new aesthetic that continues to influence fashion today. In September 2016, Maria Grazia Chiuri, Dior's first female Artistic Director, presented her debut collection and has kept the respected French house at the forefront of fashion with exceptional tailoring and forward-thinking designs. 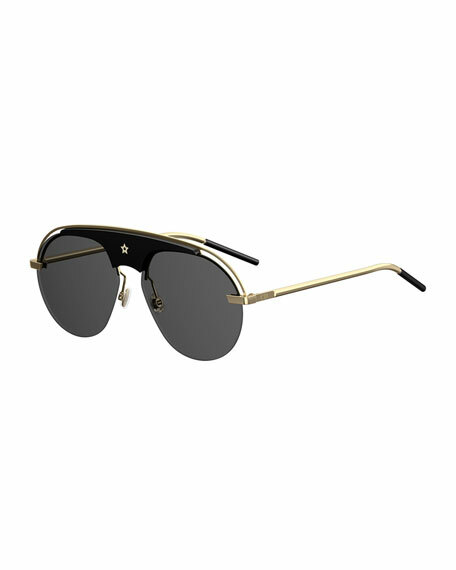 Dior "Dio(R)evolution" metal aviator sunglasses. Monochromatic lenses. Acetate nose bridge with star detail. Hinged, adjustable nose pads for comfortable fit. Open-inset detail at semi-rimless front. Logo-embossed temples with capped tips. 100% UVA/UVB protection. Made in Italy. Dior "Dio(R)evolution" aviator sunglasses in metal Lens/bridge/temple (in mm): 99-1-145. Mirrored frame front and lenses. Cutout detail at brow bar/temples. Engraved star at bridge. Adjustable nose pads. CD logo at temples. Capped earpieces. 100% UVA/UVB protection. Made in Italy. 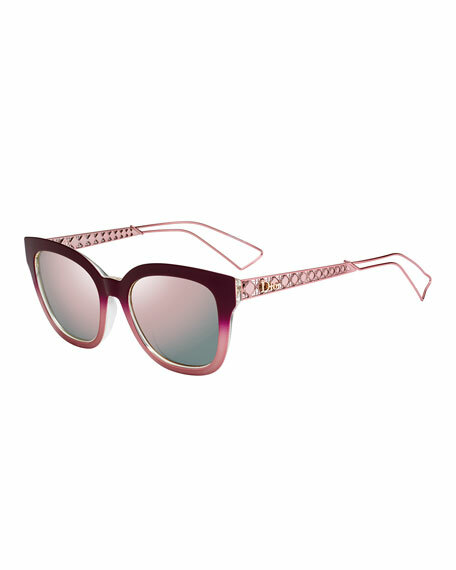 Dior "Diorama" square sunglasses, featuring outline for dimensional illusion. Metal wire and plastic frames. Monochromatic lenses. Logo and signature cannage detail at temples. Graduated, caged arms. Open-inset ear pieces. 100% UVA/UVB protection. Made in Italy. 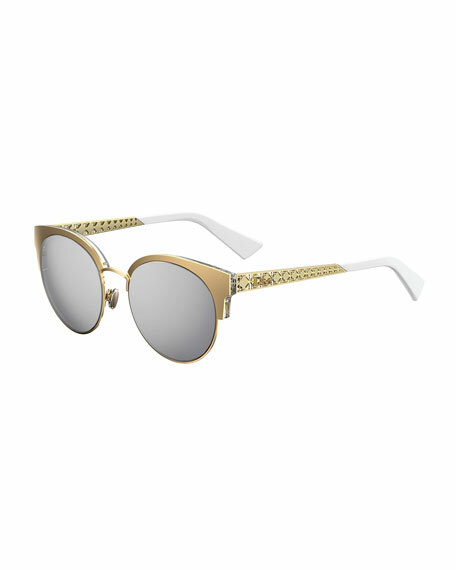 Dior "Dioramamini" square metal sunglasses. Lens/bridge/temple (in mm): 50-19-145. Round mirrored lenses. Adjustable nose pads offer comfortable fit. Semi-rimless frame front. Signature cannage temples with logo script. Capped temple tips. 100% UVA/UVB protection. Made in Italy.